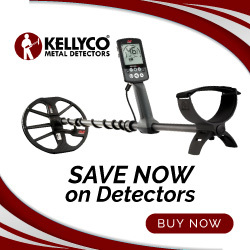 Gold Detector Reviews: Minelab's "Eureka Gold"
There is little question that Minelab metal detectors have earned top status in many professional detecting and nugget hunting circles over the past 10-15 years, despite their relatively high retail prices. The "Eureka Gold " detector ($975.00-$1,250.00) is Minelab's contribution to mid-range gold detectors and as such it performs well and can hold its own against the competition at this level. One reason for the "Eureka Gold's" success is its super-sensitive 60 kHz operating frequency that allows it to detect even tiny pieces of gold under the right conditions. The "Eureka" can pretty much march lock step with any other detector out there that runs at the ultra-high frequency (UFH) range, including Fisher's "Gold Bug 2." Hard-core aficionados of both detector brands will undoubtedly argue the finer points, but in the end "beauty is in the eyes of the beholder." In their promotional materials for the "Eureka Gold" detector, Minelab is quick to point out that their gold machine can also be operated at two other frequencies, 6.4 kHz and 20 kHz. What are the potential benefits in using those frequencies? I'll try and explain those as well as the potential limitations. Strapworks.com - any strap, any length, any color! Using the 20 kHz operating range may have benefits if you decide to shift gears and try your hand at general metal detecting (coins, beaches, relics, etc.). However, if this operating frequency is used in a nugget hunting context you'll most likely lose a bit of depth as well as some sensitivity. My view is this: the UHF function is unquestionably the most practical and useful operating frequency for detecting small nuggets and those tinier pieces of gold out there. My Problem with the "Eureka Gold"
My problem with the Minelab "Eureka" or any other detector brand that tries to be all things to all people is essentially philosophical in nature with a practical application to that subjectivity. It's my belief that most nugget hunters want a machine that is tailored to finding nuggets and nuggets alone. Multi-function operating frequencies are all well and good in a general sense, but anytime you try and cover all the bases I think you lose a bit of function and capability elsewhere. But then hey...I'm "old school!" 2-position "all metals" discrimination and 1-turn discrimination adjust. 11" round "Gold Search" coil. Finally, please understand that when it's operating in the UHF range, the "Eureka Gold" can be a force to reckon with when it comes to detecting those small nuggets. In general, you can also dispel any fears about the "Eureka Gold's" ability to handle highly mineralized zones...if ground balanced correctly, it will eliminate those problems for you. So there you have it. Be safe, be smart, and good luck out there. I recently bought a Eureka gold. I bought it for 2 reasons, fist it was an open box and sold for less than half price of new, 2nd I like the idea of of several frequency options with the same coil. I have read different reviews by different folks and it is different things to different people. A gentlemen I trust from down under only uses it with the WOT coil and only likes the 6.4 Freq. Well they have BIG gold in Australia so maybe that is best there. Another person I trust says it is at it's best at 20Khz. He has used most every detector known to man and is very savy. Then there are those who recommend using it at 60 Khz. So Personally I think it can work best at either of the 3 frequencies depending on what you want to use it for.